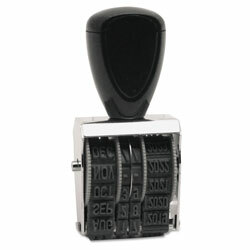 Reliable rubber stamp offers twelve years of dates for long life. Heavy-duty steel frame stands up to active use. Stamp Type: Dater; Message(s): N\A; Years: 12; Layouts Available: N\A. Traditional Stamps from U.S. Stamp & Sign! 789 In Stock today.